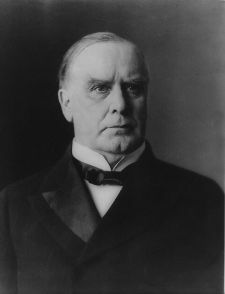 William McKinley, Jr. (January 29, 1843 – September 14, 1901) was the 25th President of the United States. McKinley was one of the most popular of all American presidents up to that time. He won his second election by a larger majority of votes than any of the presidents who came before him. He was the third president to be assassinated and the fifth to die in office, shot while attending the Pan-American Exposition in Buffalo, New York. He supported the Spanish-American War, the purpose of which was to gain control of Cuba. After the war, the United States annexed the Philippines and Puerto Rico, as well as Hawaii. McKinley supported high tariffs as a formula for prosperity, and helped rebuild the Republican Party in 1896, by introducing new campaign techniques. He presided over a return to prosperity after the Panic of 1893 and subsequent depression. He was succeeded by his vice president, Theodore Roosevelt, whose reputation came to overshadow McKinley's achievements. McKinley's administration will be best remembered for spanning the time that the United States moved onto the world stage. In the aftermath of the Spanish-American War, he was the first chief executive to confront the responsibilities of world power in Latin America and Asia. The assertive character of the modern office of the President began during his terms in office, and he laid the basis for further growth of the presidency under Theodore Roosevelt and Woodrow Wilson. McKinley was born in Niles, Ohio, the seventh child of William and Nancy McKinley. When he was ten years old his family moved to Poland, Ohio, a few miles away. McKinley attended public schools in Poland and in 1852 he enrolled in Poland Seminary, a private school, and studied there for eight years. He showed great skills in oratory from an early age and became president of the Everett Literary and Debating Society. His mother held a great influence over young McKinley and he was greatly attached to her. She had hopes that he would enter the Methodist ministry and he accepted without question her strict moral standards. At the age of 17, McKinley enrolled in Allegheny College in Meadville, Pennsylvania, but dropped out shortly afterward due to illness. In June 1861, McKinley enlisted as a private in the 23d Ohio Volunteers Union Army. McKinley served at the Civil War battles of Antietam and in the Shenandoah Valley campaign, leaving the army with the brevet rank of major, a title that he retained throughout his political career. One of his commanders was Rutherford B. Hayes (later President), who rated McKinley's soldiering highly. 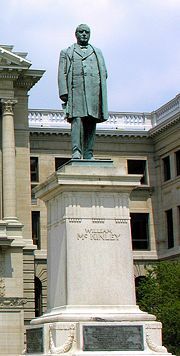 Following the war, McKinley attended Albany Law School in Albany, New York, and was admitted to the bar in 1867. He settled in Canton, Ohio to practice law and participate in politics. He became the prosecuting attorney of Stark County, Ohio, from 1869 to 1871. He was moderately successful as a lawyer, but became one of Canton’s most popular citizens. He worked successfully on the campaign of Rutherford B. Hayes, his former commanding officer. In 1869 McKinley, a Republican, was elected the prosecuting attorney by the largely Democratic Stark County. During this time, he met his future wife, Ida Saxton, daughter of a wealthy Canton businessman and banker. McKinley ran for Congress as a Republican, in 1876, and for the next 14 years, with one short interruption, sat in the House of Representatives. As a legislator he was identified with protective tariffs. McKinley believed that high tariffs benefited all segments of society. After losing the election for Speaker of the House of Representatives in 1889, he became chairman of the Ways and Means Committee and architect of the McKinley Tariff of 1890. McKinley lost his House seat in the Democratic sweep of 1890. He was elected governor of Ohio, in 1891, and served two terms. He left office as a front-runner for the 1896 Republican presidential nomination. With Mark Hanna, a Cleveland business executive and close friend, to mobilize support on his behalf, McKinley achieved an easy first-ballot victory. When the Democrats nominated William Jennings Bryan on a free silver platform, the McKinley forces pressed for maintenance of the less inflationary gold standard, endorsed high protective tariffs, and stressed social harmony amid the economic unrest of the 1890s. Seldom traveling, McKinley waged a "front porch" campaign from his home in Canton. Hanna urged large business companies to rally in support of McKinley and they contributed an unprecedented sum of $3.5 million to the Republican campaign. The country was flooded with McKinley pamphlets and posters and factory managers warned their workers that a victory for Bryan would mean a return to an economic depression and loss of their jobs. Sweeping all the large industrial states, McKinley won the election by 271 electoral votes to Bryan’s 176. McKinley defeated Bryan in the presidential election of 1896, in what is considered the forerunner of modern political campaigning. Republican strategist Mark Hanna raised an unprecedented sum for the campaign and made extensive use of the media in managing the McKinley victory. McKinley promised that he would promote industry and banking and guarantee prosperity for every group in a pluralistic nation. McKinley's presidency dealt mainly with foreign policy starting with the Spanish-American War. American industry was promoting the build-up of the navy and the acquisition of harbors in order to protect the shipment of American-made goods overseas. By the late nineteenth century, Spain was left with only a few scattered possessions in the Pacific Ocean, Africa, and the West Indies. Much of the empire had gained its independence and a number of the areas still under Spanish control were clamoring to do so. Guerrilla forces were operating in the Philippine Islands, and had been present in Cuba since before the 1868-1878 Ten Years' War decade. The Spanish government did not have the financial resources or the personnel to deal with these revolts and resorted to forcibly emptying the countryside and the filling of the cities with concentration camps in Cuba to separate the rebels from their rural base of support. President McKinley urged Spain to withdraw from the island but his urgings were met with refusal. Spain could not back down without creating a crisis at home. Civil War loomed within Spain and surrender of Cuba and yielding to American demands would have been politically disastrous. The war began primarily due to the destruction by an explosion of the U.S.S. Maine on February 15, 1898, in Havana harbor. The U.S.S. Maine was a second-class pre-dreadnought battleship and was sometimes referred to as an armored cruiser. The exact cause of the explosion is still debated, but is thought by most to have been machinery failure. At the time, it was thought to have been a mine. Historians continue to debate the extent to which propaganda, rather than true stories and actual events, caused the war. In the 1890s, while competing over readership of their respective newspapers, William Randolph Hearst and Joseph Pulitzer’s yellow journalism is said to have swayed opinions in New York City. There is not much evidence of their influence over public opinion in the rest of the country. Spanish intransigence also was a leading cause for war. Fueled by the reports of inhumanity of the Spanish, a majority of Americans became convinced that an intervention was becoming necessary. Thus, on April 11, McKinley went before Congress to ask for authority to send American troops to Cuba for the purpose of ending the civil war there. On April 19, Congress passed joint resolutions proclaiming Cuba "free and independent" and disclaiming any intentions in Cuba, demanded Spanish withdrawal, and authorized the president to use as much military force as he thought necessary to help Cuban patriots gain freedom from Spain. In response, Spain broke off diplomatic relations with the United States. On April 25, Congress declared that a state of war between the United States and Spain had existed since April 21. Congress later passed a resolution backdating the declaration of war to April 20. Spain sued for peace and hostilities were halted on August 12, 1898. The formal peace treaty, the Treaty of Paris, was signed in Paris, on December 10, 1898, and ratified by the United States Senate on February 6, 1899. When the treaty came into full acceptance on April 11, 1899, the Cubans participated only as observers. The United States gained almost all of Spain's colonies, including the Philippines, Guam, and Puerto Rico. Cuba was granted independence. When McKinley won the presidential election of 1896, the question of Hawaii’s annexation to the U.S. was again opened. The previous president, Grover Cleveland, had remained opposed to annexation through the end of his term, but McKinley was open to persuasion by U.S. expansionists and by annexationists from Hawaii. He agreed to meet with a committee of annexationists from Hawaii. After negotiations, in June 1897, McKinley agreed to a treaty of annexation with these representatives of the Republic of Hawaii. The annexation resolution was passed by the House of Representatives on June 15, 1898, and by the Senate on July 6, 1898, each with two-thirds majorities, annexing Hawaii as a U.S. territory. In 1900, McKinley again campaigned against Bryan. Although he did not personally campaign, he received the largest popular majority ever given a presidential candidate up to that time. McKinley won in electoral votes 292 to 155. McKinley appointed only one justice to the Supreme Court of the United States, Joseph McKenna in 1898. 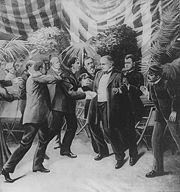 McKinley was shot twice by anarchist Leon Czolgosz on September 6, 1901, at the Pan-American Exposition in Buffalo, New York. He was less than six months into his second term. After being shot, as he saw the shooter being beaten to the ground, he cried, "Don't let them hurt him!" The newly-developed x-ray machine was on display at the fair and fully-functioning, but no one thought to use it on McKinley to search for the bullets. This might have saved his life. One of the bullets was never found. Even more ironic is that the operating room at the exposition's emergency hospital did not have any electric lighting, even though the exteriors of many of the buildings at the extravagant exposition were covered with thousands of light bulbs. Doctors used a metal pan to reflect sunlight onto the operating table where McKinley's wounds were treated. McKinley's doctors believed he would recover, and the president convalesced for more than a week at the home of the exposition's director. But McKinley eventually went into septic shock and died from his wounds at on September 14, 1901, in Buffalo. He was buried in his hometown of Canton, Ohio. The truth is I didn't want the Philippines, and when they came to us as a gift from the gods, I did not know what to do with them…. I sought counsel from all sides—Democrats as well as Republicans—but got little help. I thought first we would take only Manila; then Luzon; then other islands, perhaps, also. I walked the floor of the White House night after night until midnight; and I am not ashamed to tell you, gentlemen, that I went down on my knees and prayed Almighty God for light and guidance more than one night. And one night late it came to me this way—I don't know how it was, but it came: (1) That we could not give them back to Spain—that would be cowardly and dishonorable; (2) that we could not turn them over to France or Germany—our commercial rivals in the Orient—that would be bad business and discreditable; (3) that we could not leave them to themselves—they were unfit for self-government—and they would soon have anarchy and misrule over there worse than Spain's was; and (4) that there was nothing left for us to do but to take them all, and to educate the Filipinos, and uplift and civilize and Christianize them, and by God's grace do the very best we could by them, as our fellow men for whom Christ also died. And then I went to bed and went to sleep and slept soundly. The question is whether McKinley said any such thing as is italicized in #4, especially regarding "Christianize" the natives, or whether Rusling added it. McKinley was a religious person but never said God told him to do anything. McKinley never used the term Christianize (and indeed it was rare in 1898). McKinley operated a highly effective publicity bureau in the White House and he gave hundreds of interviews to reporters, and hundreds of public speeches to promote his Philippines policy. Yet no authentic speech or newspaper report contains anything like the purported words or sentiment. The man who remembered it—a Civil War veteran—had written a book on the war that was full of exaggeration. The supposed highly specific quote from memory years after the event is unlikely enough—especially when the quote uses words like "Christianize" that were never used by McKinley. The conclusion of historians such as Lewis Gould is that it is remotely possible but highly unlikely McKinley said the last point. (For a discussion of this question, see Gould, 1980, 140-142). ↑ Lauren Calone, William McKinley, Spanish-American War Centennial Web Site. Retrieved July 21, 2008. ↑ Alfred Mahan, "The United States Looking Outward," Atlantic Monthly LXVI (December 1890): 816-824. Faulkner, Harold U. Politics, Reform, and Expansion, 1890-1900. New York: Harper, 1959. Glad, Paul W. McKinley, Bryan, and the People Chicago: I.R. Dee, Publisher, 1991 ISBN 0929587499. Gould, Lewis L. The Presidency of William McKinley. Lawrence, KS: Regents Press of Kansas, 1980. ISBN 0700602062. Jensen, Richard. The Winning of the Midwest: Social and Political Conflict, 1888-1896. Chicago: University of Chicago Press, 1971. ISBN 0226398250. Jones, Stanley L. The Presidential Election of 1896' Madison, WI: University of Wisconsin Press, 1964. Leech, Margaret. 1959. In the Days of McKinley. Westport, CT: Greenwood Press, 1975. ISBN 0837182433. Morgan, H. Wayne. William McKinley and His America. Kent, OH: Kent State University Press, 2003. ISBN 0873387651. Offner, John L. An Unwanted War: The Diplomacy of the United States and Spain over Cuba, 1895-1898. Chapel Hill, NC: University of North Carolina Press, 1992. ISBN 0807843806. All links retrieved October 7, 2014. This page was last modified on 7 October 2014, at 19:03.